Cute layout! Love the bunny and carrot cuts. TFS! Boy, you're right! Easter is coming faster than I can count! Thanks for the design and all the work you put in to sharing the design with the tutorial with us! Very cute. I love the bunny and papers you chose! I like how you use the carrots,love the bunny!! You can bet I'll send a card to your friend's son. The men and women in the military don't get anywhere near the respect and honor they deserve. God Bless Them! As for the opportunity to win something from your blog...count me in. I've used Wild Card cart myself, so I appreciate your cards. They cut out small but lovely. Maybe I should try "fit to page" next time. Great job! Wow! You really went crazy with the cartridges! I love that you put so many to use and how the whole layout came together. The grass with the carrots tucked in is so cute and the lollipop-looking flowers, and ---well okay everything else. Thanks for the ideas. 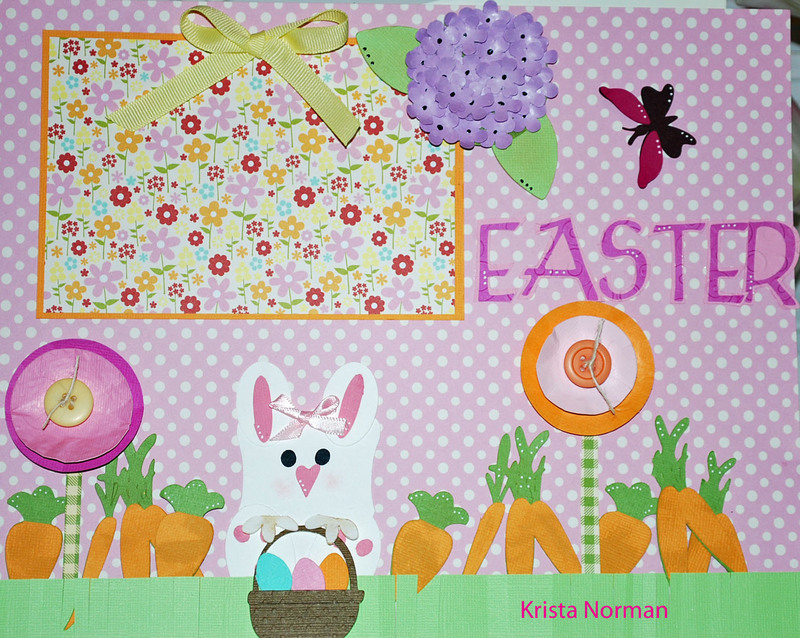 I love this Easter layout Krista! It is so springy and colorful. My favorite part is the little heart noses on the bunnies! TFS! cute layout! Love the bunnies! Cute layout and great instructions!!! What an adorable layout. Too Cute! What a super cute layout. Love it. TFS. Love all the beautiful colors! Great LO! Very cute LO, Krista. Love those lil' bunnies. Super cute layout! And thanks for the recipe on everything...so great! What a great design! I love all the bright colors. The bunnies turned out so cute! Nice layout, thanks for sharing the inspiration! What a Hoppy Layout! Luv it, you did a wonderful job! 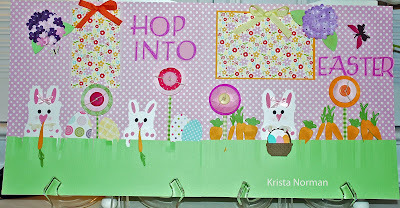 I adore the Easter layout, such cute cutouts and the papers and colors are perfect. Cute lo...I love it! TFS! Cute layout love the bunnies!!!! Love the layout and the bunnies eating carrots. Happy Easter to you & everyone. Such a great spring layout! I really like the hydrangea & all the cute little carrots. Cute flowers on this LO!!! Really cute Easter layout! Love it! Who wouldn't love this in their Easter basket? Fun! Love this layout - thanks for sharing. 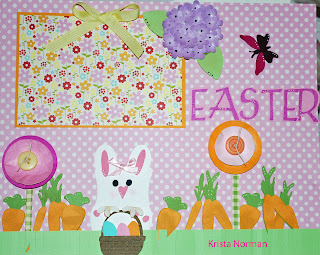 beautiful work as always krista :) ill say it again..i love your bunnies :) . Very springy layout! Love your Easter colors. TFS! Love the layout... Thanks for the great post! So springy and fun. Darling bunnies. Love the hydrangae. Great layout Krista! Love those hydrangea's!! this is adorble! Such a happy layout! Love the Easter layout! Great job! What a sweet layout. Love the colors!!! I love Spring! You did a great job with all the happy, Spring colors. Wonderful layout! Love the detail in this layout! Very springy layout. Love all the Easter colors. TFS! Cute Layout! The carrots are great!